What’s the purpose of a state constitutional amendment enshrining Roe v. Wade? New York Gov. 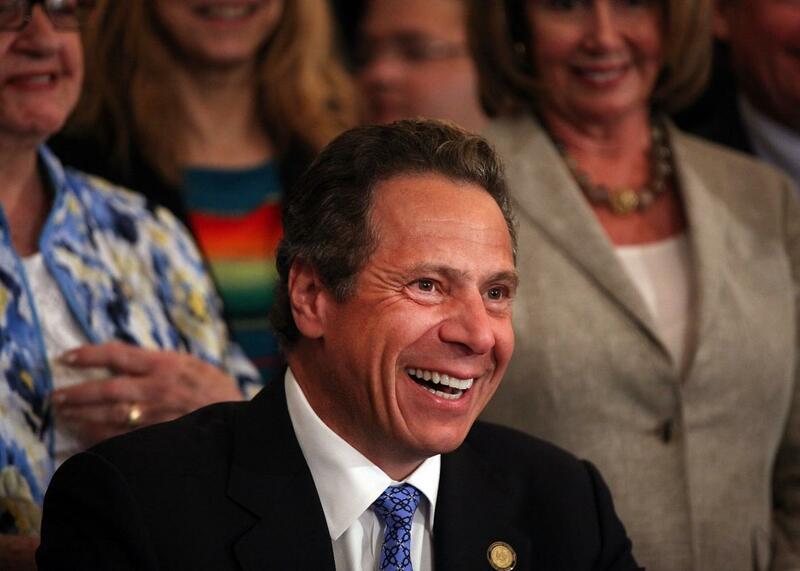 Andrew Cuomo has proposed an amendment to the state constitution that would codify the protections of Roe. The move comes as a direct response to recent acts by Donald Trump and Congress to prevent women from accessing reproductive health care. During the first week of his administration, Trump reinstated and expanded the global gag rule; the House passed a bill that would keep women from getting abortion coverage on public and private insurance; and Mike Pence gave a chilling address at Friday’s March for Life, an annual anti-abortion demonstration on the National Mall. At that event, one protester told me she thought it might be the last march they’d ever have to have because Trump was such a devoted opponent of reproductive rights. This is the second time in recent weeks that New York has moved to safeguard progressive policies from the creeping rollbacks of the new administration and Congress. New York’s attorney general recently proposed a bill that would protect and expand the Affordable Care Act’s free contraception mandate for New York residents if Congress repeals the ACA. The bill, which has passed one of two branches of the state legislature, was an answer to recent threats from Congress, though other states have taken similar measures in previous years to codify the requirement that insurers cover birth control at no cost to patients. Cuomo’s intentions with the amendment are commendable, and a statement in support of constitutionally protected bodily autonomy, as Vermont’s state legislature does in a nonbinding resolution each year, can never be bad. The current administration is undoubtedly hostile to women’s health care: Pence has said he intends to see Roe “consigned to the ash heap of history where it belongs,” and Trump has promised unprecedented crackdowns on abortion rights. Still, if the pro-Roe amendment passes, it will have little measurable effect. Abortion is already legal in New York, and the political leanings of the state make it highly unlikely that an anti-abortion majority will be elected to the state legislature in the foreseeable future. If Roe v. Wade is overturned, abortion won’t immediately become illegal across the country. The Supreme Court’s 1973 ruling just prevents states from outlawing the procedure until a fetus is viable. Without that precedent, states will be free to criminalize women who get abortions, as some states already do in certain cases. But unless the New York state legislature passes a new law criminalizing abortion, the procedure will remain legal in the state. Even Trump knows this—he’s pooh-poohed the severity of slashing Roe by suggesting that abortion-seeking women in states that would ban abortion could just visit other states that would keep it legal. The protections of Roe v. Wade also prevent Congress from banning abortion before viability by ensuring that any federal law banning abortion will not hold up in court. If Roe falls and Congress does pass such a law, a New York state law protecting abortion rights won’t matter anyway, since federal legislation supersedes state legislation. The amendment proposal is also hobbled by the issue of timing. Voters would need to approve an amendment to the New York state constitution, which would mean that it might not even go through before the end of Trump’s first term. And any challenge to Roe would likewise take years to percolate through the courts. In the end, the only thing a New York constitutional amendment would do is make it marginally harder for the state’s legislature to restrict abortion rights at some point in the future, which again, given the demographics of New York, will likely never come to pass. That’s a nice goal, but Cuomo’s amendment seems more valuable as a show of symbolism than a protection of reproductive rights.